No player has been analysed more than Philippe Coutinho at Barcelona in recent weeks. Let's look at what's gone wrong and the possible solutions to his dip in form. If we're aware of what the problem is, maybe we can find the solutions. Everyone agrees that the spark he had when he arrived has gone. For me, there are three possible origins. The first is that he's become too predictable. Everyone in the stadium knows what will happen when he gets the ball: he will move inside from the left and try and shoot (he rarely opts to link play). Rivals know what he will do now and the effectiveness of that move has reduced this season. Second. The development of Ousmane Dembele this season has limited Coutinho's opportunities. But even with Dembele out, Coutinho's not been able to take advantage of a run of games. Third. 'Cou' is possible the most fragile player in Barça's attack. Suarez, Dembele and Messi can put up with more kicks from the opposition. Coutinho loses all his physical battles. These three factors have led to a negative cycle, with the image of the player on the pitch almost a reflection of his form: it's common to see him with bad posture looking sad. And without self-confidence, there's no excitement. That image generates negativity and a limited expectation of his own performance. That doesn't favour anyone. There is a lack of confidence, a lack of vision and no clarity in his play. All of that translates to a lack of protagonism, doubts about what to do and a return to his old moves... which starts the same cycle all over again. The advantage to a the problem being a cycle is that the solution could come at any point of the cycle, to change the rest of it. A physical improvement is unlikely in the short-term but it's key if he wants to succeed in the medium-term. Coutinho must improve his physical presence and his resistance, which will allow him to be much more consistent. A new trick or piece of genius could also start a new winning cycle as his rivals would not be sure what he was going to do in one on one situations. 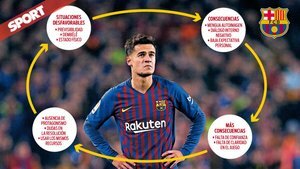 If Coutinho is capable of changing his internal dialogue (looking for example at his best performances and believing in them) his self-confidence could return and his appearance at important moments would help him gain confidence again. Whatever it is he must do, his coach and teammates have shown plenty of support in him. Now it's up to him. Never better said: the ball is now in his court.